Larry Watts is running out of time in his series examining December 1989 in Romania. In a comment to the steadfast Timisoara participant and researcher, Marius Mioc https://mariusmioc.wordpress.com/, on Watts’ English language blog back in February 2015, Watts stated that this is a 5 part series (http://larrylwatts.blogspot.com/2015/01/romanian-revolution-december-1989-i.html#comment-form). This is now the 4th part of the 5 part series and Larry is still deconstructing the claims of others who negate his arguments–two episodes in a row now being focused on my research–rather than providing evidence that substantiates his claims. Mr. Watts, we are still waiting: when will we read the sightings of such Soviet “tourists” engaging in nefarious behavior in December 1989 as witnessed at the time by average citizens who were in the streets?…as opposed to the recovered memories of former Securitate officials (see his episode 3) or Nicolae’s Ceausescu’s “indicatii pretioase” of the time! (see below)? Oh, no! You’ve got to be kidding me! Looks like we are headed for another one Larry’s Long Laborious Lectures on Lessons Learned from Looking at Literature in Libraries. Please say it ain’t so, Larry! Historians rank primary source evidence according to their general reliability, accuracy and vulnerability to interested manipulation. The least accurate and least reliable are media reports. For a variety of reasons the press as institution is the most vulnerable to internal and external manipulation. Public communiqués establishing official positions and reactions, while usually more accurate in terms of declaratory policy, are also a form of self-interested and self-conscious political advertising – an image of policy that leaders purposefully project to domestic populations, allies and adversaries – and thus often not a faithful reflection of actual policy. Damn, my fears have been confirmed! “The utility of any primary source evidence for evaluating leadership policy (whether state, government or party) is dependent on its origins and intention….Historians rank primary source evidence according to their general reliability, accuracy and vulnerability to interested manipulation.” You mean, Larry, for example, that the post-facto claims and recovered memories of high ranking officers of the security establishment of a repressive regime who want to cover up their misdeeds and crimes might not be accurate and devoid of self-interest? Most accurate and reliable are executive decisions, internal discussions and intra-governmental instructions that are not designed for public consumption. These documents best reflect real intent and policy. Actual military (and intelligence) plans and deployments are often considered highly accurate indicators of intent and policy. However, these institutions are also more susceptible to bureaucratic inertia and may reflect defunct policies of former leaders, regimes and international situations rather than current policy during periods of transition. The Brezhnev-Andropov-Chernenko era plans and deployments that for the most part remained in effect in the Soviet military and KGB under Gorbachev’s “New Thinking in Foreign Policy” during 1988-1991 provide a case in point. Larry, how about the musings and justifications of a DICTATOR, surrounded by toadies, so “rupt de realitate”–out of touch with reality–that he believes the only way people could protest against him is if they were manipulated by tourists from surrounding countries all of which, according to him, had become “foreign agents” bent on overthrowing his regime? In his discussions of Romania’s December 1989 revolution, Richard Andrew Hall overturns this hierarchy, dismissing the primacy of documented internal leadership deliberations in favor of international media reporting that supports his argument, and accepting and promoting their dubious assertions as solid fact. From this rickety base Hall then makes other assertions dependent upon it such that the careless reader is led off into a wilderness of speculation and self-contradiction. Damn, Larry, I gotta give you credit: comparative source credibility/reliability and chain of acquisition in collecting information, never crossed my mind! Thanks for the tip, Larry! Larry, apparently you have already forgotten that in episode 3 of your series, you attacked my use of the declarations of high ranking Securitate officers in the immediate weeks and months after December 1989 while in custody? Now, you allege here, that I hinge everything on a single foreign media report? Larry wants internal regime documents. Good. Here is one I have used elsewhere on multiple occasions before (dating back to the 1990s). 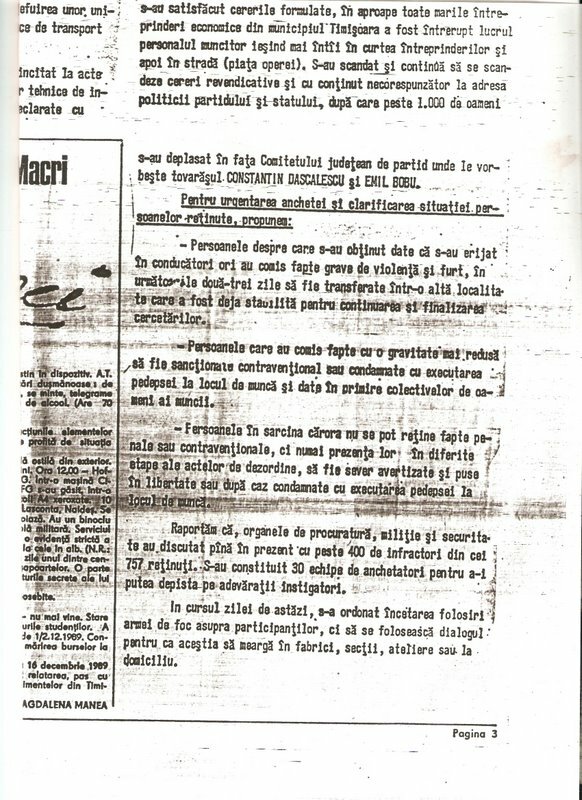 I am sure Larry will have some mechanism of denial, but for the sake of other readers: The Securitate’s Last Report to Nicolae Ceausescu in December 1989 (includes discussion of events from 16-20 December)! Please note: No mention whatsoever of the alleged role played by “Russian tourists” or “Soviet tourists” as being behind the uprising against Nicolae Ceausescu and his communist regime! 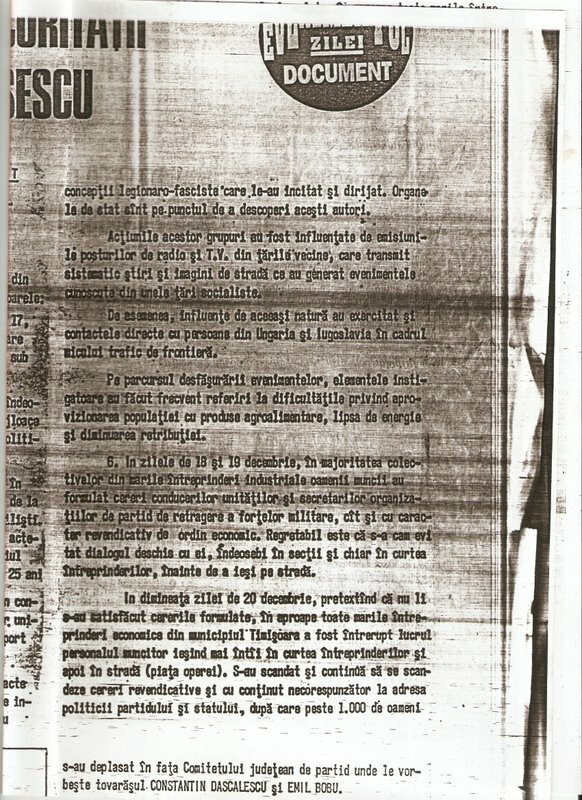 published in Evenimentul Zilei, 28 iulie 1992, p. 3. Was Ceausescu Worried About “Soviet Tourists” Or Not? “I have also given the order to interrupt all tourist activity. Not a single foreign tourist should be allowed in, because all have become espionage agents. Likewise, the small cross-border traffic should be shut down immediately. I have given the order to the Ministry of Interior but those from [Ministry of] Tourism must be called immediately, and the unoccupied rooms should be given to Romanian citizens. From what I can tell in the chronology of your research on the topic, Mr. Watts, you did not know or think of this until I posted Bunea’s reproduction, which dates from several years earlier. [Am stabilit sa nu mai primim in perioada urmatoare turisti straini sis a nu mai aiba lo casa-zisul mic trafic de frontiera. Il suspendam! Vom reveni mai tirziu. Acum nu avem timp de mic trafic de frontiera! Fiecare sa se ocupe de problemele lor! I will invoke Timisoara participant and researcher Marius Mioc’s comment on Watts’ Adevarul post here: if the specific Soviet threat was so important here–in, at the time, closed, behind the doors, discussions–why did Nicolae Ceausescu not single out the Soviets DIRECTLY? http://adevarul.ro/cultura/istorie/revolutia-romana-decembrie-1989-iv-evaluarea-celor-mai-bunedovezi-1_554b3da1cfbe376e35f1018c/index.html) My hunch: a truly paranoid person makes few distinctions between those who are perceived as “against them,’ regardless of the reality! The problem with Hall’s reasoning is that specific complaint was made only against Soviet bloc“tourists.” Aside from the odd Bucharest-based diplomat attempting to visit Timisoara the only troublesome Westerners were the journalists who attended the RCP Plenum in November and never left. Although Ceausescu never mentioned western “tourists,” he did single out the socialist countries three times. First, to order that none of their citizens be allowed into Romania, then to underscore that none of them were trustworthy, and finally, to underscore that all “tourists” sent to Romania from the socialist countries came as hostile espionage agents. And the repeated reference to “small cross-border traffic” can only refer to the traffic into Romania from its socialist neighbors. Note the key phrases in Watts’ summary: First, to order that none of their citizens be allowed into Romania, then to underscore that none of them were trustworthy, and finally, to underscore that all “tourists” sent to Romania from the socialist countries came as hostile espionage agents. Just a tad paranoid, no??? One wonders whether Watts understands the difference between the suppositions and paranoid delusions of a dictator on the ropes in the face of his own people, and the diplomatic language of officials having to deal with decisions based on a dictator’s paranoia? The ambassador then requested instructions from his ministry on how to field Soviet demands for explanation of the border closure. In spite of this daily mention of Soviet “tourists” ever since Ceausescu first ordered that they be stopped at the borders on December 17, Hall considers his contention that the regime was unconcerned by Soviet “tourism” proved by the AFP report of December 19, 1989, claiming that two Romanian border guards at the frontier with Yugoslavia told a journalist to: “Go back home, only Russians can get through!” Hall reproduces this report in subsequent posts as if it were an unproblematic truth – and better evidence than the Transcript of the PolExCom meeting of December 17, 1989. “Why,” Hall asks rhetorically, “was it precisely ‘Soviet travelers coming home from shopping trips to Yugoslavia’ who were the only group declared exempt from the ban on “tourism” announced on that day?” (Hall on Soviet Tourists #1) It is possible, although not plausible, that the journalist actually heard – and the border guards actually made – such a declaration. In no way, however, could that be taken as representative of Romanian policy at the time. Documentary “best evidence” indicates that no such exemption was ever given. To the extent that Mircea Munteanu wishes to address this, I will leave it to him. As in the previous episode 3 of Watts’ series, this is an example of absolutely pathetic parsing: “those in transit” vs. “tourists transiting Romania”!!! In fact, only several days earlier Bucharest had decided to continue a very specific form of non-tourist transit traffic from the Soviet Union. This exception is described by the Romanian ambassador in his December 18 Telegram. This time the error is one of nuance. But that nuance has significant implications. 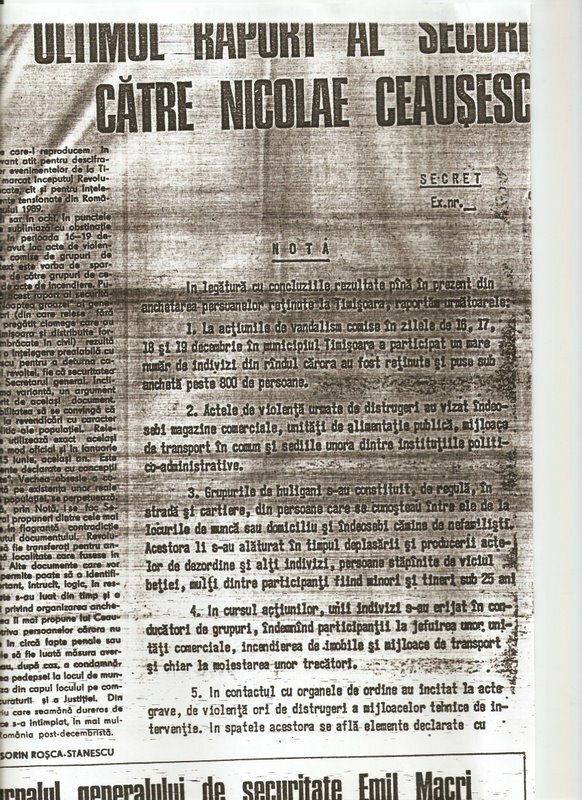 Munteanu translates “se stabileasca” as “emigrate (emigra)” but it is more accurately translated as “to settle” or “immigrate (imigra).” Obviously, only Tel Aviv could decide who was approved to settle in or immigrate to Israel. Munteanu’s stipulation of Soviet government approval for such transit does not clarify; it misleads. The sentence actually describes an established Romanian practice of granting visas to Soviet Jews leaving the USSR. It makes no reference to Soviet authority because the visa exception existed as a result of Romania’s long-term cooperation with Israel, not because of Soviet initiative. The TAROM representative was instructed to continue this practice by Bucharest, not by Moscow. In the internal deliberations of the Political Executive Committee on December 17, 1989, Ceausescu ordered a halt to “all tourism” from “the neighboring socialist countries” because those tourists operated as “espionage agents.” He also forcefully expressed his belief that the USSR bore chief responsibility for organizing “all that happened and is happening in [East] Germany, Czechoslovakia and Bulgaria now, and in the past in Poland and Hungary.” (See CPEX Transcript 12/17/89.) Ceausescu viewed Moscow as driving this process, and the United States in a supporting role. The diplomatic correspondence between the Romanian foreign ministry and its embassy in Moscow explicitly identified Soviet tourism as a problem that Bucharest prohibited. Together, the internal executive deliberations and Romanian diplomatic correspondence soundly debunk AFP’s claim that Soviet tourists had free entry, not the other way round. “In the internal deliberations of the Political Executive Committee on December 17, 1989, Ceausescu ordered a halt to “all tourism” from “the neighboring socialist countries” because those tourists operated as “espionage agents.” He also forcefully expressed his belief that the USSR bore chief responsibility for organizing “all that happened and is happening in [East] Germany, Czechoslovakia and Bulgaria now, and in the past in Poland and Hungary.” (See CPEX Transcript 12/17/89.) Ceausescu viewed Moscow as driving this process, and the United States in a supporting role.” Need I say more? Watts proves his own counter-case! Yeah, there is no difference between the reported speech of claimed eyewitnesses to events and journalists who claim to hear something first hand? Just generalize and taint en masse! Solid research methodology might not deliver results anticipated or desired, but it will bring us closer to answers that the evidence actually supports. Testimony after the fact and media reports crafted for public consumption are almost never superior in accuracy and reliability to non-public internal deliberations and decisions produced in the course of events. Continued reliance on the former to the neglect of the latter is unlikely to answer or clarify the outstanding questions regarding Romania’s Revolution of December 1989. “Solid research methodology might not deliver results anticipated or desired, but it will bring us closer to answers that the evidence actually supports.” PHYSICIAN: FIRST, DO NO HARM! SECOND, HEAL THYSELF!